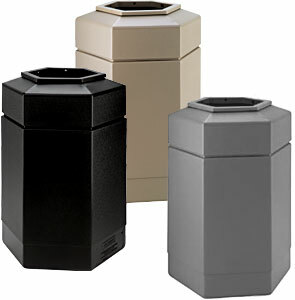 Heavy-Duty blow-molded waste receptacles made from long-lasting polyethylene are designed for high-volume heavy use and manufactured to withstand the harshest environments. In addition, the interior and exterior of the 30 Gallon Hex can be easily cleaned with a standard degreaser. These models made from post consumer recycled (PCR) material, up to 50% PCR content. All models are shipped in a carton made from 50% recycled content. Use Standard 39 Gallon Trash Bag.